It was a hot summer day. 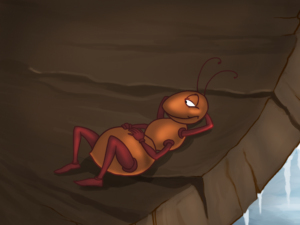 A grasshopper was lying in the shade, relaxing from the heat of the sun when an ant passed by. 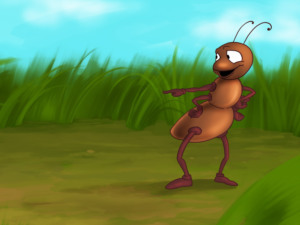 The ant was dragging a huge seed in order to store it for the winter. 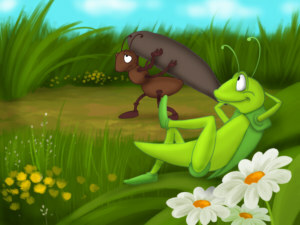 Just looking at the ant made the grasshopper feel tired. "Ant, why do you work all day long? Why don’t you sit for a while and sing a song with me?” he asked, and he took out his violin. “I am gathering food for the winter when it will be cold and there will be no food. 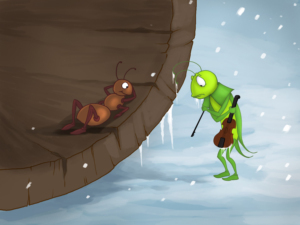 It would be a good idea if you did the same," the ant answered. “Oh Ant, why worry about the winter? 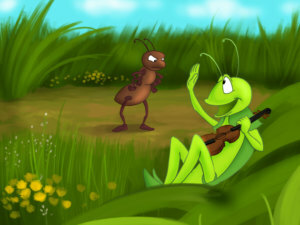 There is plenty of food right now!” the grasshopper replied. 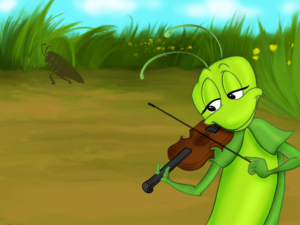 The ant walked away with his load, leaving the grasshopper playing his violin and singing.